Uncover the rich history and beautiful landscape of ancient Lycia. 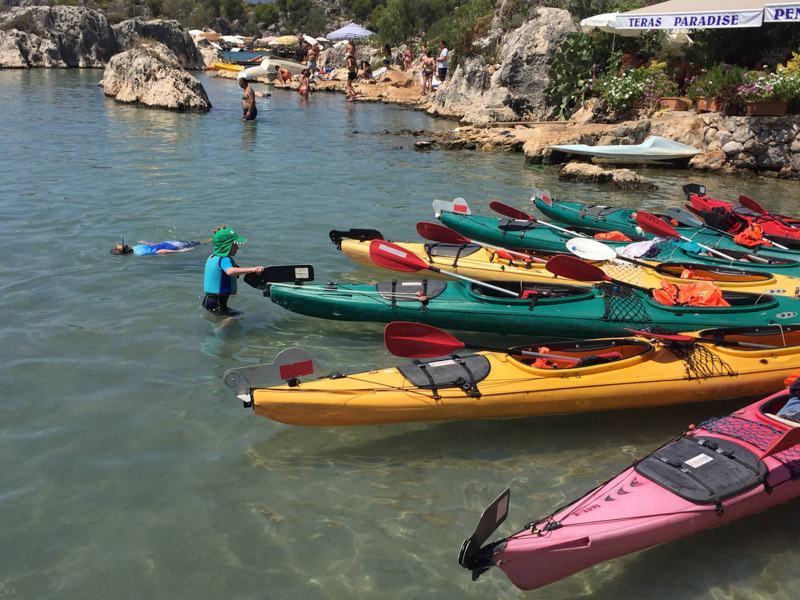 Canoe from the historic city of Xanthos to the beach at Patara, kayak over the sunken ruins of Kekova and explore the foothills of the Taurus Mountains, enjoying a delicious lunch with a local family. Spend our evenings exploring the cobbled streets and enjoying local Turkish cuisine in the delightful sea side town of Kas. Arriving in Dalaman Airport, we transfer to Kas and check into our hotel. Kas is one of the most beautiful ports on the Turkish riviera and our hotel, the Club Phellos, is conveniently based right in the centre which allows you to enjoy the atmosphere of this vibrant town, both on land and at sea. Please note that the journey time from Dalaman Airport to Kas is around two and a half hours. Where flights arrive around the same time we will group transfers together. Our first day here is spent on the sea, as we take a boat trip from Kas across the surrounding calm and clear waters. From the sea we can appreciate fully this dramatic and beautiful coastline. There will be ample opportunity for swimming and snorkeling from our boat, and we plan to enjoy a barbecue lunch before returning to Kas later in the afternoon. Kas is a great place to relax, with cafes and restaurants spilling out onto cobbled streets and a network of tiny backalleys to explore. Today we head for the hills to explore where we find cedar forests, streams, shady glades and tiny charming villages where the pattern of life has remained almost untouched for centuries. We plan to walk between these mountain villages and take lunch with a local family in a typical village house, before returning to Kas via the silver sand beach of Kapitas. Located just west of Kas, Kapitas is an idyllic spot for a swim at the end of our day in the mountains. Finally we make our way back to Kas. Today is left free for you to do some exploring of your own. For those with a hankering for culture, Kas is built around the remains of a number of ancient sites including; Kas Theatre which was built during the third century BC and is now used for theatrical performances and music concerts, the monumental Lion Tomb and a number of hillside rock tombs. Alternatively you may like to visit the isolated and ruggedly beautiful Greek island of Meis (optional), to give its Turkish name, Kastellorizo. The island is just one mile from the Turkish coast and yet more than 100km from Rhodes, its nearest Greek neighbour. We visit Xanthos this morning which was the capital of ancient Lycia and at one time was the largest centre of commerce and religion in the region. The town has had a turbulent past, falling to both the Persians and the Romans and on both occasions, this resulted in the mass suicides of the entire population!. During the Roman civil wars of the 1st century BC, the Lycians sided with Caesar against Pompeius but after Caesar's assassination in Rome, Brutus attacked Xanthos and demolished the acropolis. Marc Antony rebuilt their city and today it is a UNESCO World Heritage Site. We travel by canoe in the afternoon as we travel down the Xanthos River to Patara. Passing through tranquil and unspoilt rural backwaters along the way, we stop for a picnic lunch before eventually emerging at Patara Beach which is a protected nesting area for giant loggerhead turtles. 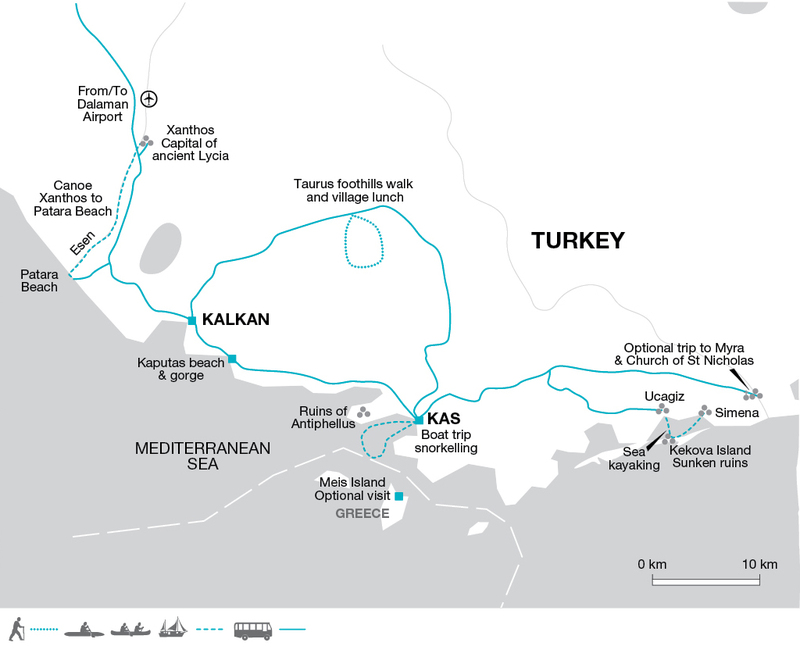 We have the opportunity to swim on the return to Kas. There is an opportunity this morning to visit the Church of St Nicholas at Demre (Myra) which is where the 4th century Bishop Nicholas is said to have anonymously given money to the poor thus spawning the legend of Father Christmas! Saint Nicholas is the patron saint of two countries; Greece and Russia, and is also the protector of children, merchants, scholars and sailors - a busy man! The origin of Saint Nicholas's gift giving is believed to have arisen from a legend in which a shopkeeper was too poor to supply his daughters with dowries. When Saint Nicholas heard of their plight, he threw three bags of coins into the shopkeeper's yard, saving the daughters from a life of hardship. The Church of Saint Nicholas was built after his death and Noel Baba's remains were placed in a rock sarcophagus. A modern statue of Saint Nicholas, complete with beard, bag of toys, and children has been placed outside the church. But Myra isn't just the home of Santa. A mile north of the church is the impressive ruins of the ancient town, where dozens of Lycian tombs are carved out of the cliff above a Roman amphitheatre. We plan to make an early start today (to beat the crowds and heat) but on returning to Kas there is a free afternoon either to relax or perhaps try snorkelling. Day 7 - Sea-kayaking over sunken ruins to Kekova Island, visit Simena Castle. We depart in the early morning to try our hand at sea kayaking in the calm, protected waters of the bay of Kekova. We'll enjoy a packed sandwich breakfast with coffee en route and enjoy paddling in the tranquil waters before any other boats or kayakers take to the water. It's one of the most scenic areas in Lycia with picturesque islands, bays and small ancient cities surrounding the famous sunken city of Kekova. The results of various earthquakes, there are partly submerged streets and buildings visible in the crystal clear waters and even steps leading down into the depths of the bay. Later we paddle to the picturesque whitewashed village of Simena, whose harbour is dotted with ancient sarcophagi (tombs), Roman baths, houses that cling to a hillside and a castle where we find an ancient theatre. Carved from the solid rock, it is a wonderful place to sit and soak up the beautiful surroundings. Taking to the waters again, we head back to Ucagiz from where we transfer back to Kas. Day 8 - The trip ends after breakfast in Kas. The trip ends after breakfast in Kas. Please note that the journey time from Kas to Dalaman Airport is around two and a half hours. Where flights adepart around the same time we will group transfers together. Day 4 or 6: Horse riding £38 per person including return transport to the stables. Day 4 or 6: Scuba diving from £30 to £60 depending on number of dives; experienced divers should bring certification and log book; intro dives are available for those without previous experience. The long Turkish summer can be hot, though much of the Mediterranean coastline is freshened by sea breezes. A warmer sweater is recommended for the evenings in early or late season. On the canoeing and sea-kayaking excursions in particular there is no shelter from the sun, so a sunhat is essential. March / April and late September / October / November tend to be cooler so bring layers and some warmer clothes. A light rainjacket may also be useful. Trainers or walking boots for walks, plus sandals to wear in the canoes and sea kayaks which will stay on when wet. We recommend a water bottle, torch, insect repellent, sunglasses, daysac and plenty of high factor suncream. All equipment is provided on the sea-kayaking and canoeing trips. Keen snorkellers should take their own equipment as sizes (especially children's) are limited. Note: Qualified scuba divers wishing to dive should bring their diving certificate and log book. The hotel is situated in the centre of Kas and is a short walk from the sea. The en suite rooms are tastefully decorated and include a sea or hill-side view, air-conditioning, satellite TV, minibar and hairdryer. 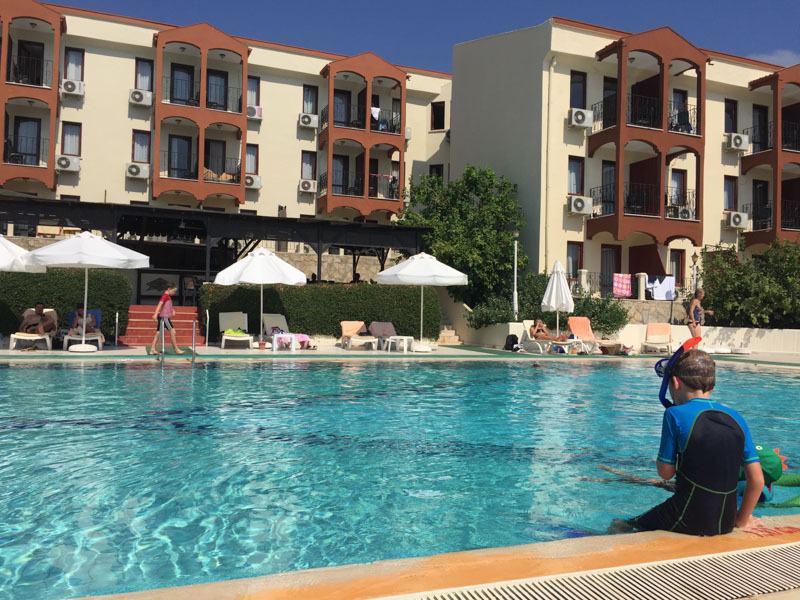 The hotel facilities include a restaurant with a good selection of both local and western cuisine, outdoor swimming pools plus a children's pool and a 40 metre water slide. Furthermore, the hotel has three bars, basketball court, safe boxes, laundry service and fitness centre. Wi-Fi is available in the spacious lobby. Active family holiday on Turkey's Mediterranean coast: Our base for the week is the picturesque seaside town of Kas. Perfectly located mid-way between Dalaman and Antalya bordering the crystal clear waters of the Mediterranean. Spend days on the water, kayaking along rivers and in the sea, and sailing on a traditional gulet, snorkelling and swimming from the boat. We also have a full day to amble along village trails in the Taurus foothills as well as free time to explore more of the region steeped in history and blessed with breath-taking beauty. Our base for the week is the Club Phellos Hotel located a short walk from the harbour with great views out to the ocean. The hotel features a large outdoor pool complete with a 40 metre water slide; snack bar and extensive breakfast terrace. It’s possible to combine this trip with a week cruising on a traditional gulet. See our Legends of Lycia and Cruising the Turquoise Coast tour for details. Triple Rooms: This trip allows the option for triple rooms to be included for the whole trip. If you would like this option, please ask our Sales team for further information. Average Age: As a guide we have identified the actual average age of the children who have travelled on this trip over the last 5 years, to help you decide whether it's the right one for your family. The average age on this trip is 11 years old; this trip is suitable for children of all ages including younger families. This family holiday allows you the opportunity to explore the region with visits to local villages as well as enjoying a number of arranged activities including; sea kayaking over sunken ruins, canoeing along a river to a secluded beach on the coast and a boat trip on a traditional gulet, hand built in teak and pine. Turkey offers fantastic value at the moment, with a great price, you can take your family can enjoy a week of active adventure with ample time to relax by the hotel pool or local beaches.